Protesters clashed outside chocolate cafe Max Brenner yesterday, when those in support of a boycott on the Israeli-owned business were verbally attacked by counter-protesters. About 40 members of the groups Justice for Palestine, Socialist Alliance and the global Boycott, Divestment and Sanctions on Israel movement, marched on the Southbank store in dismal weather conditions. Indignant and vitriolic shouts of protest from about 100 counter-demonstrators drowned out the usually serene and relaxed area that hosts the weekly markets. Curious onlookers, drawn by the shouts of slogans and the waving of banners and posters, formed a circle around the demonstrators. A small barricade and line of police officers was all that separated both sides of protesters and kept it from repeating the violence and arrests that marked protests in Melbourne. Slogans accusing Max Brenner of endorsing apartheid were heard as dissidents of the movement consisting of people from the Jewish community as well as the Australian Tea Party angrily voiced their criticism of the BDS movement and accused them of emulating the anti-Semitic boycott and destruction of Jewish businesses by the Nazis in the 1930s. The movement, which launched its first Brisbane campaign, denounced Max Brenner and blamed its parent company the Strauss group of being complicit in the murder of Palestinians by supplying the army with care packages during the Palestinian occupation. Spokesperson of Justice for Palestine Brisbane Sarah Giles said she was happy with the march’s result and said they’ planned future action to highlight the links between the Strauss Group and the Israeli occupation. “I think this was a good way to start the campaign here in Brisbane. I don’t think we’ll be letting Max Brenner off the hook by staying away from their shop,” she said. Organiser and spokesperson for Justice for Palestine Brisbane Hamish Chitts said the counter-protesters tried to smear the group by making historical comparisons to Nazi Germany. “It’s a deliberate misinformation campaign, comparing what we’re doing to Nazi Germany,” he said. 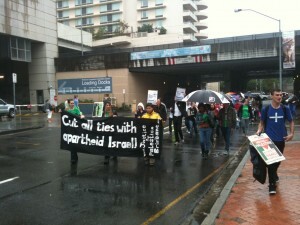 “We’re an anti-apartheid movement. The people involved in this campaign are people who have had [previous] involvement with fighting for human rights. “Supporters for Israel can’t justify the way they’re treating the Palestinian people so they discredit and smear us”. Max Brenner supporter and organiser of the counter protest Danielle Keys defended the allegations. “If they are marching on Max Brenner and are using aggressive force in order to boycott the business and alter the decisions of other people, they intimidate customers, they intimidate staff – yeah, if that means smearing them then I’m smearing them,” she said. Ms Keys, a law student from University of Queensland, said she had experienced verbal abuse and intimidation from alternative socialist groups at other marches, and criticised the behavior of the pro-boycott groups at Max Brenner franchises in Melbourne and Sydney. “They were riots. They were completely just bullying staff, bullying patrons in the most unceremonious way,” she said. Good for the supporters of the chocolate shop owner! !Everyone has had enough of these socialists lefties! !